Both of these feathered beauties are from Blockheads Paper Arts' brand new Steampunk-esque "Fringe Folktails" and in celebration of the launch the set is currently on sale for $12! All the feathers are coloured with a combo of E0000, 000, 11, 13, 15, 18 and 41. 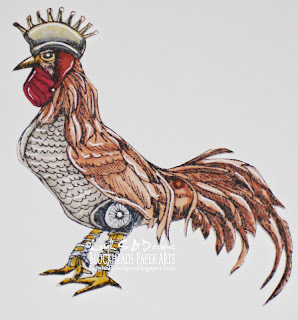 The Rooster's Head gear: E15 and 09, Crown: Y17 and 23 with W1 and C3 to give it a tarnished gold effect and also add some shadows. Beaks: Y17 and 23 with R39 and 46 on the Rooster. Talons: Y17 and 23. Owl's eyes are G09 and all the Steampunk get-up: W1, 3, 5, C0, 3 and 5. Complete the look with touches of metallic silver and gold Promarkers with hightlights of white gel pen. Completely cut out the images with a pair of sharp detail scissors. 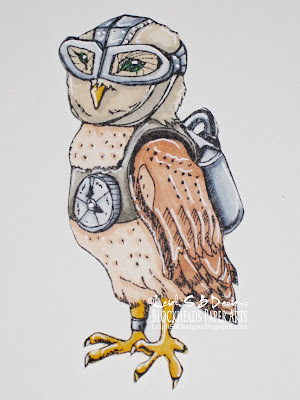 Add Judikins Diamond Glaze to the Owl's googles for a glass-like finish. Soo cute, Leigh!! I want to go to that party! I have to get my goggles and funny hat on and I'll be ready! Beautiful coloring on all the images! Great idea to add the glossy accents to the goggles. LOVE the backstory - how much fun! Love the coloring! Wonderful charaters and the colouring is just fantastic, I also want to come to the tea party! Very cool, Leigh! Your coloring of these guys is amazing!